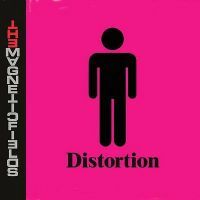 Another of the numerous outlets for indie-rock Svengali Stephin Merritt, The Magnetic Fields’ Distortion continues the group’s new tradition of self-referentially titled theme albums by turning up the fuzz on nearly every element of this one’s outstanding 38 minutes. They don’t, of course, but sentiments like that should let you know exactly what this album is about. Start with something good, then do more of what works. Interestingly, the band employed a very strict and (for this age of computerised performing and recording, anyway) adventurous rule of “no synths.” Whether this is the group’s blatant rebellion against modern pop machines or a nod to heavyweights past is open to interpretation, but Distortion‘s perpetual “this + that” method suggest it’s at least a little bit of both. Stylistically, the songs are quite the mixed bag. Opener “Three-Way” sounds almost like a Go! Team outtake, while “Drive On, Driver” subtly hints in a not-so-subtle fashion at an alternate universe where REO Speedwagon vocalist Kevin Cronin shares a band with Jesu’s Justin Broadrick. This may sound ridiculous, but this is what The Magnetic Fields do best, and their masterful execution are what make stabs like these – and most everything else on Distortion – work almost flawlessly. This album won’t make them famous, but if there’s any comfort in crafting a true work of art then The Magnetic Fields can surely take it.